I now have a special love for Manhattan Fish Market. Even before the first morsel of food was served, we were told in our 'Menu Tour' that Manhattan Fish Market, a food company based in Malaysia and presence in about 10 countries, comes to India and CHENNAI is the first outlet in their India attempt. CHENNAI!!! Isn't that amazing? Not Delhi, not Mumbai, not Bangalore but Chennai! So, disclaimer, I love this place already! OK, so this is a spacious two floor restaurant with about three private dining rooms which is high tech, with apple TV, a board, (yes, a board with chalk) and an almost board room type seating. The waiter then takes you through a menu tour explaining their menu. Oh, I forgot, as soon as you enter they all shout, WELCOME, that can almost startle you! If I were to shorten their 5 minute menu tour to one line, it would be, 'they have five types of cooking. Poach, Grill, Flame, Bake and ......,' I forgot the fifth. But they have five! Yeah, Fried is the fifth type. So four of settled for one fish n chips, one Manhattan Flaming Platter and one Lobster Platter, along with a citrus drink. The waiter said, the drinks, soups and starters and main course will be out in 4, 7 and 17 minutes. Now, that is some confidence. 17 minutes? How did he judge that!?! The drink came first with the soups. 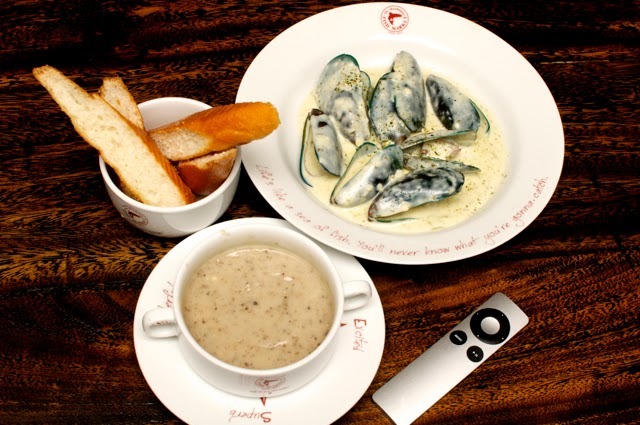 The mushroom cream soup was pretty nice and slightly salty (in a nice way though). Nope, I did not count time because we were busy playing around with iTunes and the fish n chips and (oh yeah, our vegetarian friend ordered some mushroom fries) came along. My snotty friend put on his "I AM UK RETURN" hat and said that the fish wasn't dripping in oil. One bite later, I couldn't have cared what the 'original' would have tasted like. This fish was fantastic. The sauce that came with it was equally fantastic. I did not try the mushrooms, so, I don't know how that was, but I went on and on with the fish n chips. 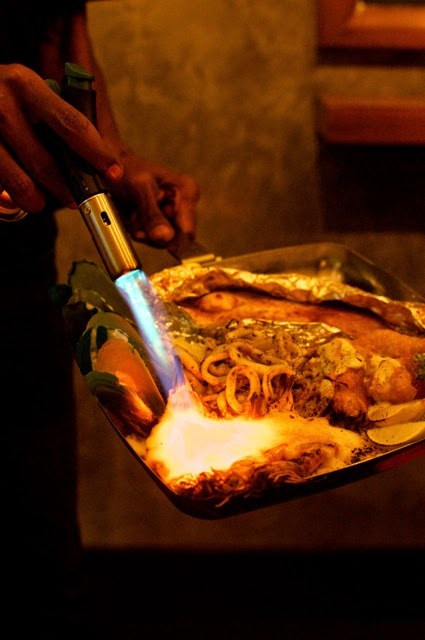 The main courses arrived and since both platters had one dish in their signature 'flame' style, we were shown some theatrics! 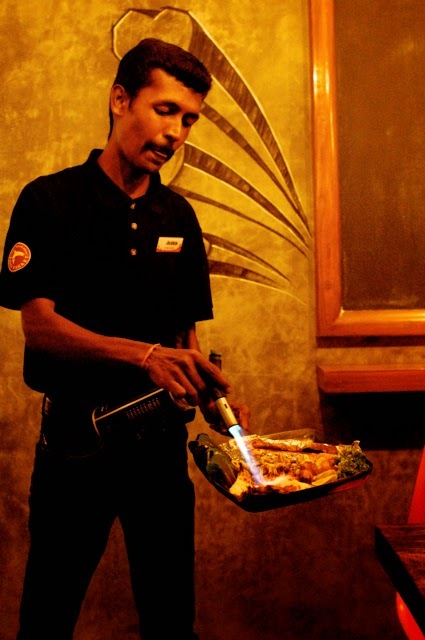 A blow torch and the prawns and lobsters were flamed right in front of you. The Manhattan Platter priced at Rs. 990 had flamed prawns, poached fish, grilled calamari, some style mussels, and fried oysters. All of this on a bed of herbed rice and a generous portion of fries. I loved the rice and the fries and totally fell in love with the flamed prawns, but didn't like the mussels and the grilled calamari. The fish was alright. 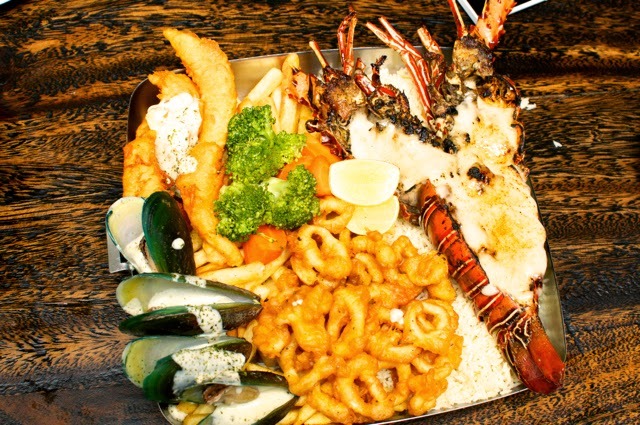 The Lobster platter, priced at Rs. 2490 had this fantastic flamed lobster, superb fried calamari, the same mussels and fish fingers that were very similar to the fish n chips. The flamed lobster was brilliant and the creamy soft and slightly burnt flavour is lip smacking. We had quite some disagreement with some foods. Friends really liked the mussels while I didn't. Maybe I need to acquire a taste for that. 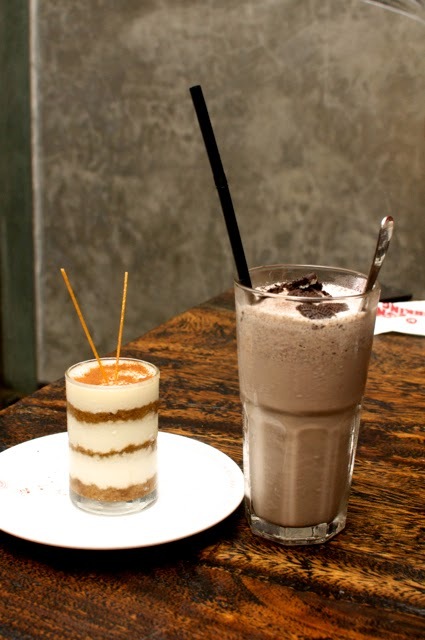 For me the two desserts, mud pie and tiramisu were a total disappointment, while the friends liked that too! Just so you know the fish is imported and fresh off the Marina and maybe thats why the price is a little high, but they use DORY fish and going by what we had, it was lovely!!!!! But extra points for choosing to start India operations in Chennai! And when I go back, my order will be prawns and fish n chips!!! Again and again! 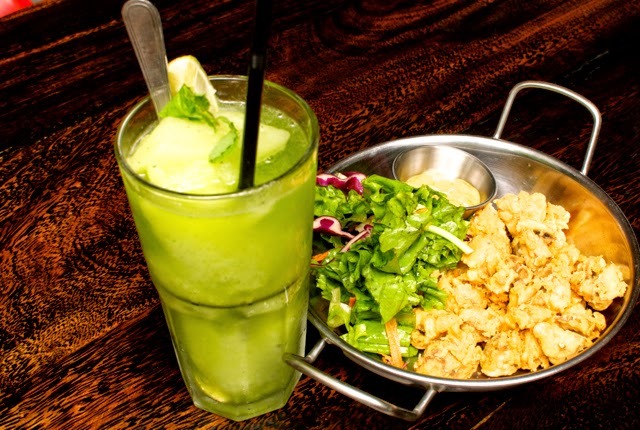 If you don't order the lobster, a meal for two could be done with Rs. 1500! 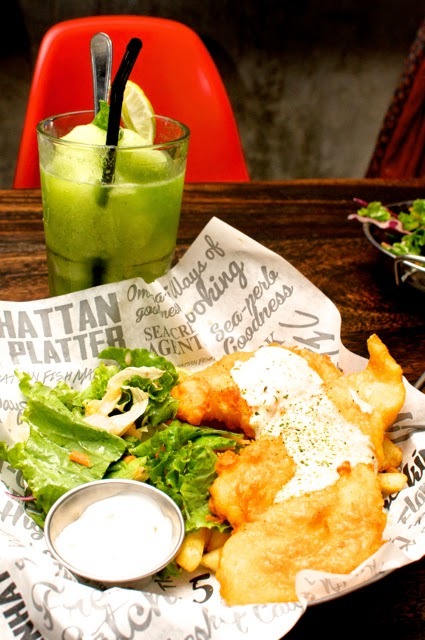 Manhattan Fish Market is on RK Salai, just off the Marvel Cards/Yellow Pages Junction.